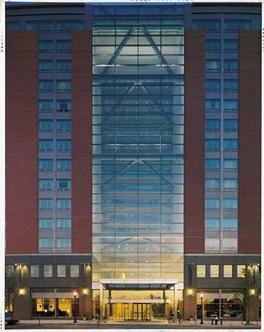 The Embassy Suites New York hotel stands in the heart of New York City's Financial District and downtown Manhattan's historic city landmarks, popular attractions and trendy neighborhoods of TriBeCa, SoHo and Greenwich Village. The only upscale, all-suite hotel on the waterfront in lower Manhattan, this full-service Embassy Suites hotel is directly across from the World Financial Center, adjacent to the Battery Park Esplanade, within walking distance of the New York Stock Exchange and Statue of Liberty/Ellis Island Ferry, and surrounded by parks and breathtaking views of the Hudson River and New York Harbor.Embassy Suites New York Hotel Features: Luxurious and spacious two-room suites with living room and private bedroom - some with skyline or harbor views. High-speed Internet access, sofa sleeper, microwave, luxurious bath amenities, plush terry cloth robes, mini-bar and two flat screen televisions (with web access) in all guest suites. Complimentary full cooked-to-order breakfast provided to each guest daily. Complimentary Nightly Manager's reception featuring your favorite snacks, beverages and cocktails. 20,000 square foot New York Sports Club and fully equipped Business Center on-site. Hotel anchors an extensive retail and entertainment complex in Battery Park City that features a movie theater, DSW Shoe Warehouse, and several restaurants and bars (including Applebees, Chevy's and more).Nearby Big Apple Attractions & Other Things to Do In New York City: Discover Downtown's famous museums and many historical attractions Times Square, Central Park, Broadway theaters and Rockefeller Center are also just a quick taxi or subway ride away. Lower Manhattan's trendy shopping is just minutes away at Century 21 Department Store, Bloomingdale's SoHo, South Street Seaport, and the many hip shops found in SoHo and TriBeCa. Enjoy discounts to some of the Big Apple's best attractions with our NYC Sightseeing Package. Are you a Hilton HHonors member? Check out our Triple HHonors Points Package and Double HHonors Points Package and earn points during your stay. Easy access to all three area airports (LaGuardia, JFK and Newark International), as well as Penn Station, Port Authority Bus Terminal and Grand Central (via taxi or subway).Looking for a great deal? View all of our Embassy Suites New York hotel packages and special offers currently available.Book a Big Apple Meeting at the Embassy Suites New York hotel. Click here to view our Group Value Dates.